Ninety-five percent of all beer and soft drink cans in the United States are made of aluminum. American can makers produce about 100 billion aluminum beverage cans a year, equivalent to one can per American per day. While almost all food cans are made of steel, aluminum's unique properties make it ideal for holding carbonated beverages. The typical aluminum can weighs less than half an ounce, yet its thin walls withstand more than 90 pounds of pressure per square inch exerted by the carbon dioxide in beer and soft drinks. Aluminum's shiny finish also makes it an attractive background for decorative printing, important for a product that must grab the attention of consumers in a competitive market. Aluminum was first identified as an element in 1782, and the metal enjoyed great prestige in France, where in the 1850s it was more fashionable than even gold and silver for jewelry and eating utensils. Napoleon III was fascinated with the possible military uses of the lightweight metal, and he financed early experiments in the extraction of aluminum. Although the metal is found abundantly in nature, an efficient extraction process remained elusive for many years. Aluminum remained exceedingly high-priced and therefore of little commercial use throughout the 19th century. Technological breakthroughs at the end of the 19th century finally allowed aluminum to be smelted cheaply, and the price of the metal fell drastically. This paved the way for the development of industrial uses of the metal. Aluminum was not used for beverage cans until after World War II. During the war, the U.S. government shipped large quantities of beer in steel cans to its servicemen overseas. After the war most beer was again sold in bottles, but the returning soldiers retained a nostalgic liking for cans. Manufacturers continued to sell some beer in steel cans, even though bottles were cheaper to produce. The Adolph Coors Company manufactured the first aluminum beer can in 1958. Its two-piece can could only hold 7 ounces (198 g), instead of the usual 12 (340 g), and there were problems with the production process. Nevertheless, the aluminum can proved popular enough to incite Coors, along with other metal and aluminum companies, to develop better cans. The next model was a steel can with an aluminum top. This hybrid can had several distinct advantages. The aluminum end altered the galvanic reaction between the beer and the steel, resulting in beer with twice the shelf life of that stored in all-steel cans. Perhaps the more significant advantage of the aluminum top was that the soft metal could be opened with a simple pull tab. The old style cans required the use of a special opener popularly called a "church key," and when Schlitz Brewing Company introduced its beer in an aluminum "pop top" can in 1963, other major beer makers quickly jumped on the band wagon. By the end of that year, 40% of all U.S. beer cans had aluminum tops, and by 1968, that figure had doubled to 80%. where a punch driven into a circular slug formed the bottom and sides of the can in one piece. The Reynolds Metals company introduced an all-aluminum can made by a different process called "drawing and ironing" in 1963, and this technology became the standard for the industry. Coors and Hamms Brewery were among the first companies to adopt this new can, and PepsiCo and Coca-Cola began using all-aluminum cans in 1967. The number of aluminum cans shipped in the U.S. rose from half a billion in 1965 to 8.5 billion in 1972, and the number continued to increase as aluminum became the nearly universal choice for carbonated beverages. The modern aluminum beverage can is not only lighter than the old steel or steel-and-aluminum can, it also does not rust, it chills quickly, its glossy surface is easily imprintable and eye-catching, it prolongs shelf life, and it is easy to recycle. The raw material of the aluminum beverage can is, of course, aluminum. Aluminum is derived from an ore called bauxite. U.S. aluminum producers import bauxite, primarily from Jamaica and Guinea. The bauxite is refined and then smelted, and the resulting molten aluminum is cast into ingots The aluminum base, for beverage cans consists mostly of aluminum, but it contains small amounts of other metals as well. These are typically 1% magnesium, 1% manganese, 0.4% iron, 0.2% silicon, and 0.15% copper. A large portion of the aluminum used in the beverage can industry is derived from recycled material. Twenty-five percent of the total American aluminum supply comes from recycled scrap, and the beverage can industry is the primary user of recycled material. The energy savings are significant when used cans are remelted, and the aluminum can industry now reclaims more than 63% of used cans. The small ripples at the top of the metal are called "ears". "Earing" is an unavoidable effect of the crystalline structure of the aluminum sheet. lost between each circle, but manufacturers have found that minimum aluminum is lost when the sheets are wide enough to hold two staggered rows of seven blanks each. About 12-14% of the sheet is wasted, but can be reused as scrap. After the circular blank is cut, it is "drawn" or pulled up to form a cup 3.5 inches (8.9 cm) in diameter. 2 The small cup resulting from the initial draw is then transferred to a second machine. A sleeve holds the cup precisely in place, and a punch lowered swiftly into the cup redraws it to a diameter of about 2.6 inches (6.6 cm). The height of the cup increases simultaneously from the initial 1.3 to 2.25 inches (3.3 to 5.7 cm). The punch then pushes the cup against three rings called ironing rings, which stretch and thin the cup walls. This entire operation—the drawing and ironing—is done in one continuous punch stroke, which takes only one fifth of a second to complete. The cup is now about 5 inches (13 cm) high. 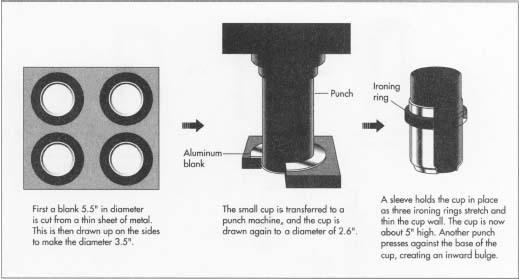 Then another punch presses up against the base of the cup, causing the bottom to bulge inward. 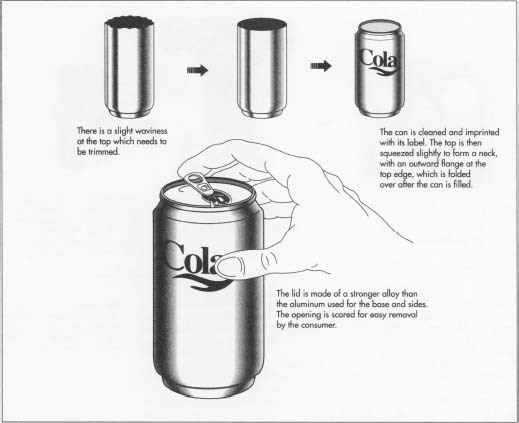 This shape counteracts the pressure of the carbonated liquid the can will contain. The bottom and lower walls of the can are also a little thicker than the upper walls, for added strength. 3 The drawing and ironing process leaves the can slightly wavy at the top. These small ripples in the metal are called "ears." "Earing" is an unavoidable effect of the crystalline structure of the aluminum sheet. Aluminum companies have studied this phenomenon extensively, and they have been able to influence the placement and height of the ears by controlling the rolling of the aluminum sheet. Nevertheless, some material is lost at this stage. About a quarter inch is trimmed from the top of the can, leaving the upper walls straight and level. 4 The drawing and ironing process leaves the outer wall of the can with a smooth, shiny surface, so it does not require any further finishing such as polishing. After the ears are trimmed, the can is cleaned and then imprinted with its label. After the can is decorated, it is squeezed in slightly at the top to a make a neck, and the neck is given an out-ward flange at the very top edge, which will be folded over once the lid is added. 5 The lid is made of a slightly different alloy than the aluminum for the base and sides of the can. The inward bulge of the bottom of the can helps it withstand the pressure exerted by the liquid inside it, but the flat lid must be stiffer and stronger than the base, so it is made of aluminum with more magnesium and less manganese than the rest of the can. This results in stronger metal, and the lid is considerably thicker than the walls. The lid is cut to a diameter of 2.1 inches (5.3 cm), smaller than the 2.6-inch (6.6 cm) diameter of the walls. The center of the lid is stretched upward slightly and drawn by a machine to form a rivet. The pull tab, a separate piece of metal, is inserted under the rivet and secured by it. Then the lid is scored so that when the tab is pulled by the consumer, the metal will detach easily and leave the proper opening. To ensure that the cans are made properly, they are automatically checked for cracks and pinholes. One in 50,000 cans is usually found to be defective. 6 After the neck is formed, the can is ready to be filled. The can is held tightly against the seat of a filling machine and a beverage is poured in. The lid is added. The upper flange formed when the can was given its neck is then bent around the lid and seamed shut. At this point, the can is ready for sale. Some aluminum is lost at several points in the manufacturing process—when the blanks are cut and the ears are trimmed—but this scrap can be reused. Cans which have been used and discarded by consumers can also be reused, and as mentioned above, recycled material makes up a significant percentage of the aluminum used for beverage cans. The savings from recycling are quite significant to the industry. The major expense of the beverage can is in the energy needed to produce the aluminum, but recycling can save up to 95% of the energy cost. Can producers also try to control waste by developing stronger can sheet so that less aluminum goes into each can, and by carefully controlling the manufacturing process to cut down on loss through earing. The lid of the typical can is smaller in diameter than the walls in order to conserve the amount of aluminum that goes into it, and as world-wide demand for beverage cans continues to grow, the trend is to make the lid even smaller. A new can introduced in 1993 with a lid a quarter-inch smaller in diameter than most cans can save manufacturers $3 per thousand. This figure seems small until it is multiplied by the hundreds of millions of cans produced each day in the U.S. It becomes clear that any small savings in raw materials or energy can be a major step in conserving both money and resources. Worldwide production of aluminum beverage cans is steadily increasing, growing by several billion cans a year. In the face of this rising demand, the future of the beverage can seems to lie in designs that save money and materials. The trend towards smaller lids is already apparent, as well as smaller neck diameters, but other changes may not be so obvious to the consumer. Manufacturers employ rigorous diagnostic techniques to study can sheet, for example, examining the crystalline structure of the metal with X-ray diffraction, hoping to discover better ways of casting the ingots or rolling the sheets. Changes in the composition of the aluminum alloy, or in the way the alloy is cooled after casting, or the thickness to which the can sheet is rolled may not result in cans that strike the consumer as innovative. Nevertheless, it is probably advances in these areas that will lead to more economical can manufacture in the future. Smith, George David. From Monopoly to Competition: The Transformations of Alcoa, 1888-1986. Cambridge University Press, 1988. Hosford, William F. and John L. Duncan. "The Aluminum Beverage Can." Scientific American, September 1994, pp. 48-53. Larson, Melissa. "New Ideas Come In Cans." Packaging, April 1993, pp. 30-31. Singh, S. Paul. "Internal Gas Pressure on the Compression Strength of Beverage Cans and Plastic Bottles." Journal of Testing and Evaluation, March 1993, pp. 129-31. I'm wondering if there has been a recent change in how the cans are made. After purchasing a total of four cases of Coke over a period of a few weeks, I found all the soft drink to be flat. Just this week I bought a case of Pepsi instead, but unfortunately, I've opened two cans and both are flat. This time I saved my receipt and plan on returning the Pepsi. I scanned the internet to see if others were experiencing the same thing and found that they are. Since it's doubtful that both Coke and Pepsi are having trouble with carbonation, I'm looking to the possibility that the problem is with the cans or the canning process. I'm hopeful you may be able to provide me with an answer. We required a fully automatic aluminum can making machine please give me information about manufacture company about details. Thank you brother, You are caring me through my engineering assignment. May the gods praise your soul in Valhalla.